Exploring a few unique family Christmas portrait ideas can turn ho-hum photographs into frame-worthy holiday portraits. Best of all, a fresh perspective on the often tedious task of Christmas photography can be fun for the entire family. Christmas is a time for family, good food and gifts. In addition, the holiday calls for decorations, brightly-colored clothes and Santa hats. For photography buffs Christmas yields an almost unlimited supply of unique photo ops. Snap-happy parents use the season to capture and preserve festive holiday memories. If you are looking for ways to spice up this year's holiday photographs, consider the following ideas. For those who are creatively challenged, it can help to choose a theme before shooting. Instead of trying to think up a slew of family Christmas portrait ideas, settle on a specific theme in which the family can participate. Then, collect the necessary materials and start shooting. If special clothing is a factor make certain to get everyone's Christmas outfits early so the shoot goes off without a hitch. If you're having trouble coming up with a theme, try one of these popular ideas. Snowmen and Sledding: Make good use of fun and games by capturing beloved outdoor family activities. Make it a Meal: Use the Thanksgiving dinner table as a set for your Christmas photos. All you need are a few well-placed Christmas props and a Santa hat or two. Say it With Santa: Who says St. Nick is just for kids? Take advantage of your local mall's Santa set and invite the whole family in for a picture with Santa Claus. A Wreath of Smiles: Combine a little bit of tradition with a whole lot of fun. Position the family behind a large holiday wreath and shoot several images of everyone looking through its center. Mix it up with goofy faces or sweet smiles. Bucking Tradition: Bring a touch of warmth to the holidays by choosing a beach scene for your Christmas portraits. Build a "snowman" out of sand, wear swimsuits and Santa hats or write "Merry Christmas" near the surf while everyone gathers around. If you don't live near a beach, plan a summer trip and use the idea for next year. 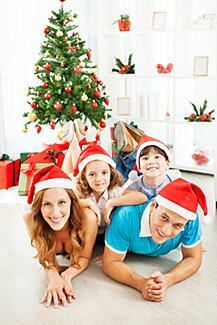 Evergreen Moments: Share the magic of a Christmas tree by making it the centerpiece of your holiday portraits. Outdoors, capture dad and the kids hauling the tree through a snowy field, or photograph the family's tree-trimming festivities indoors. Setting up photo shoots that revolve around Christmas can get pricey for the truly zealous. Fortunately, people with a more frugal approach can still capture great holiday images to share with family and friends. Making the most of existing scenery and holiday backgrounds often produce artistic results with a dose of originality. Family Nativity: Ask a local minister if your family can pose in front of the church's nativity scene. Gather Round the Fire: Don your finest holiday threads and gather in front of the Yule log. Although simple, the imagery invokes warmth and closeness. The Great Outdoors... with a Twist: Snowy scenes at midday make nice Christmas photos, but to step it up a notch take a few strands of Christmas lights and twist them around a tree. The soft glow lights up cheery faces and adds a warmth to the images. Family Art: Have family members draw their favorite holiday symbols on a white sheet. Hang it up on a wall and pose the family in front of the collective masterpieces. There are some poses that work best for holiday portraits and simply wouldn't work for other family scenes. All Aglow: Light up the excitement on your children's faces with a few well-placed Christmas lights. Another cute photo idea is to pose the family on the floor in front of a Christmas tree and carefully tangle them up in a string of Christmas lights. True Gifts: Wrap different sized wooden crates or boxes in pretty gift wrap and sit the youngest family members in front on the boxes, with the older family members kneeling behind them. Another option is to wrap and decorate smaller gifts, and have family members hold them in the portrait. Words and Letters: Have each family member hold a letter that spells out a word like "Joy" or "Christmas". The More the Merrier: Aim for more than one "perfect" photograph and incorporate the results into your greeting card. Change it Up: Take a few photos in black-and-white or change the arrangement of your subjects. Variety can spice up your images in surprising ways. Crafty Embellishments: Christmas is the perfect time of year to go all out with festoons and flourishes like bits of yarn, miniature ornaments, silver bells or holly. With a little imagination, it's a snap to produce exciting portraits for the holiday season to share with friends and family. Remember, the best holiday photos are ones in which your photo subjects are most at ease, so don't try too hard to come up with outlandish portrait ideas. Often less is more.